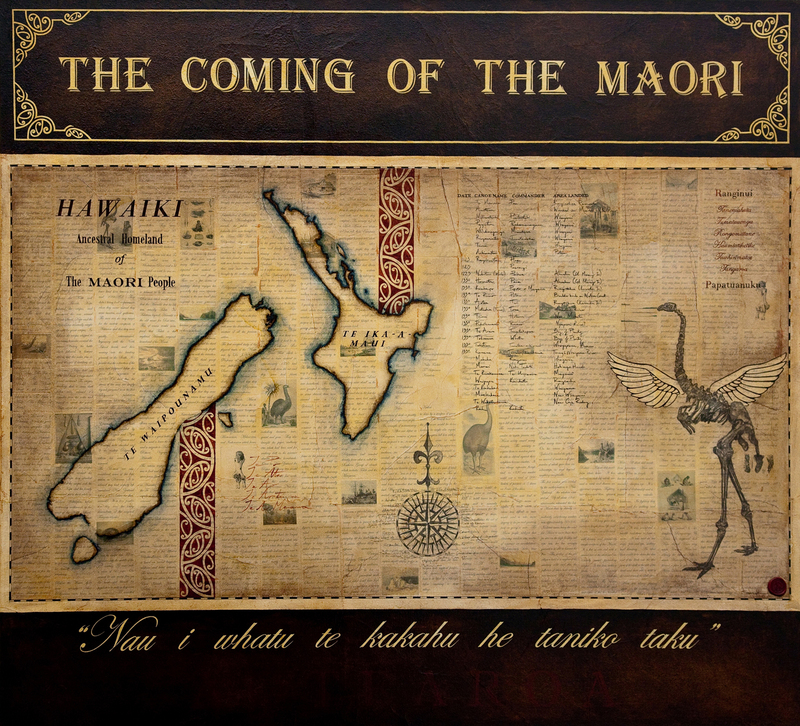 This work was inspired by the book ‘The Coming of the Maori’ By Te Rangi Hiroa/Sir Peter Buck. Kowhaiwhai: Based on ‘Koiri’ from the Tai Rawhiti area. The design means to flourish. I used this Kowhaiwhai to represent the Polynesian/Maori people’s adjustments to their new environment in Aotearoa. The Flying Moa Bones: Represents two things, 1st the fascinating mythology that came with the Maori but also was added to and created here in Aotearoa. 2nd the loss of the giant moa and how the earliest cultures in Aotearoa were still hunters and gatherers. The Star Compass: This compass is believed to represent the celestial navigation method used by the Polynesians to traverse the enormous expanse that is the Pacific Ocean. Handwritten script: This is part of the creation story, the progression from darkness to light as told by Te Ahukaramu, a 19th century Ngati Raukawa chief. The Waka list: is that of the earliest settlers to Aotearoa, which includes the name of each waka along with the approximate date of arrival the commander and area landed.